Airy, not too heavy, and just right for overnight or longer backpacking trips. Plus, you get padded and contoured hipbelt and shoulder straps with an integrated whistle for safety. External pocket for water bottles, and daisy chains let you rig it with extra or bulky items. It even has an integrated rain cover to keep your stuff inside dry. Made of 210-denier nylon with a water-resistant polyurethane coating. Airmesh overlay on back panel and shoulder straps wicks sweat. Adjustable shoulder harness lets you adjust the torso length to get a great fit. Padded, contoured ergonomic straps have a height adjustable sternum strap with integrated whistle. Top loading design with an interior spindrift collar and a floating lid. Lid has two pockets: one on top and a hidden security pocket underneath. 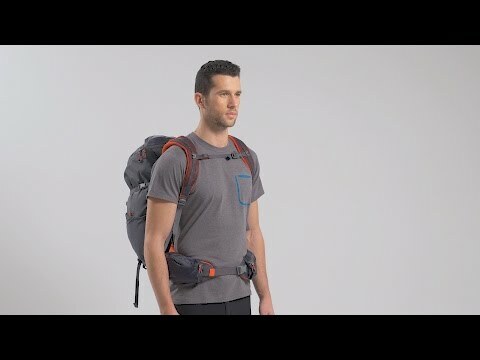 Hipbelt pockets let you keep snacks or a small camera within easy reach. Dual daisy chains on front panel and shoulder straps.